For 2015 HITCON CTF(http://ctf.hitcon.org/) contest we decided to present something special for the hacker teams - a Star Wars-themed lightsaber score board! The CTF contest involves each team attacking each other to"capture the flag"through system exploits. 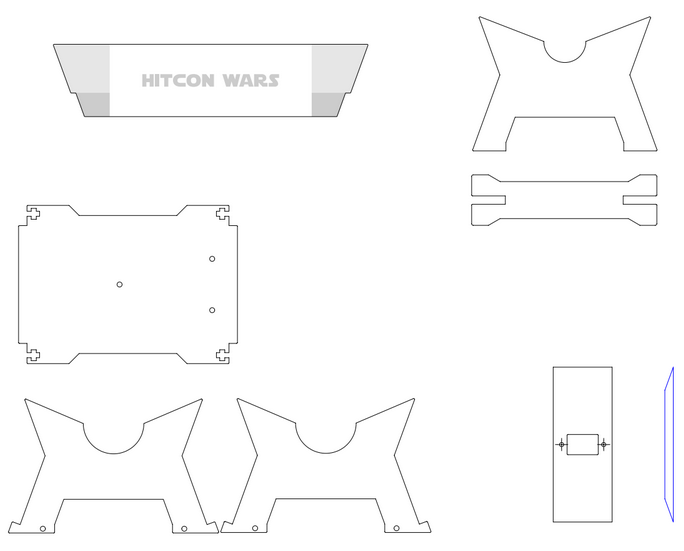 Since the theme this year is HITCON Wars we thought it would be cool to use lightsabers to indicate the attacks and point captures of each team. 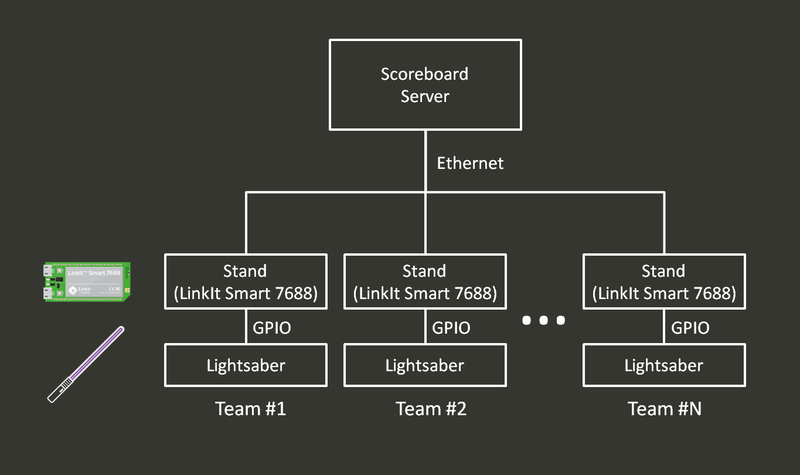 To achieve this we make a lightsaber stand that is connected to the contest scoreboard server, and dock the lightsaber to the stand. 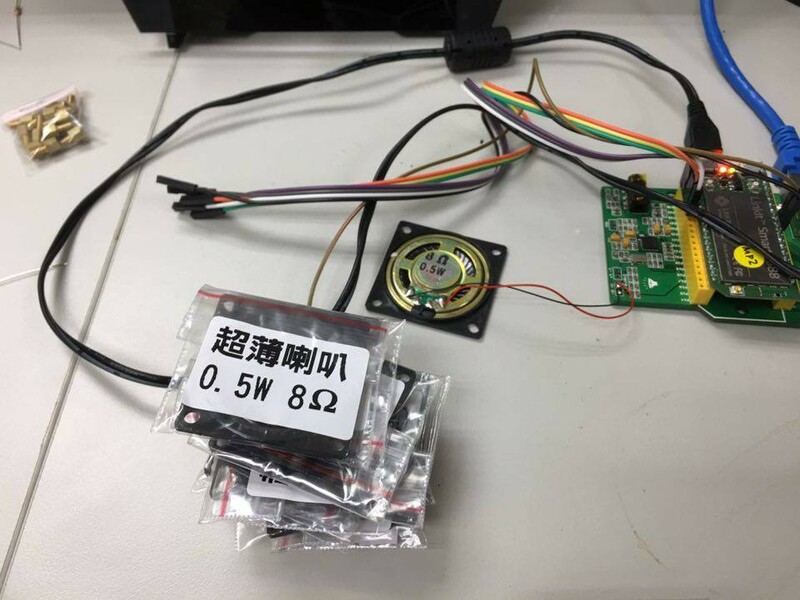 Inside the stand we use a MediaTek LinkIt Smart 7688 board which runs OpenWRT Linux to receive updates from the scoreboard. When a point is captured, the stand changes the length of the lightsaber beam length and plays an attacking sound effect. The stand listens to the updates from the server, changes the length of the lightsaber blade, and plays sound effect, as shown in the video. Software in the Lightsaber stand. We now go through each components one by one. We want the teams joining the CTF contest can take lightsabers back home after the contest, so instead of building our lightsabers from scratch we decided to mod the light sabers built by Makoto Tsai, a well-known lightsaber smith in Taiwan. He was kindly enough to helping us modding several lightsabers with an external interface that allows external control of the LEDs inside the blade. 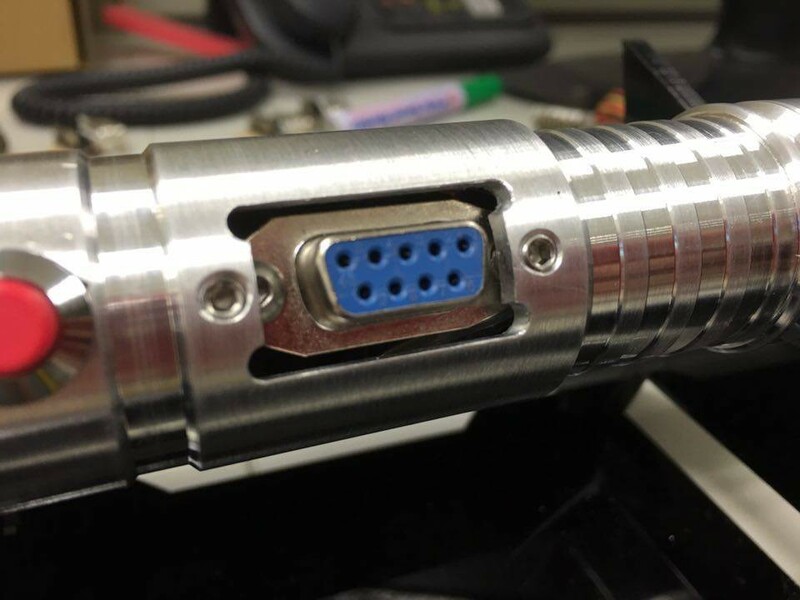 A D-Sub connector is used to dock and connect the lightsaber and the stand. When there is no external control attached, the lightsaber works normally and is controlled by the internal control board inside the saber hilt, as shown in the diagram above - so it functions as a normal lightsaber alone. Once the lightsaber is docked to the stand, external control takes control over the LEDs inside the blade part. 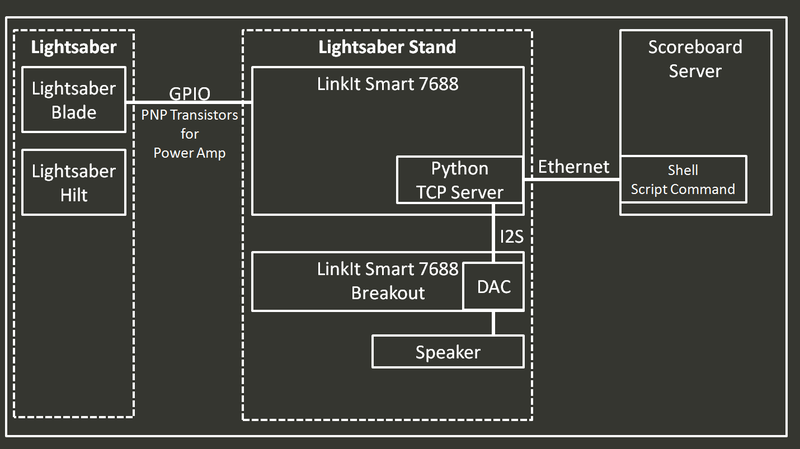 The control protocol is straightforward: 6 GPIO pins controls the 6 segments of the lightsaber blade, amped by 6 PNP transistors, and shares a common GND. So what we need is to breakout the connection between the LED strips to the control board inside the hilt. This way, the length of the blade can be controlled through external circuits, and the lightsaber keeps its original functionality. The D-Sub connector after inserting into the hilt. The hilt is cut and modded by Makoto. So this is how we mod the lightsaber - thanks to the wonderful lightsaber from Makoto! Now we proceed to the design of the saber stand. So we need to construct the connector to the lightsaber, and connecting the server through ethernet and plays audio. 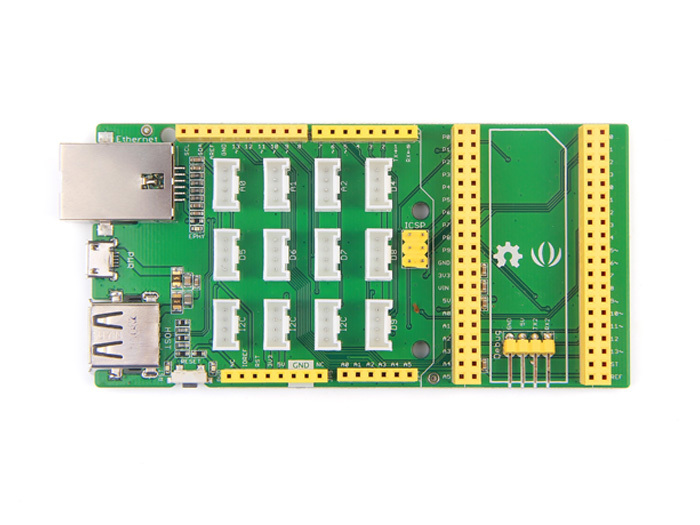 We use a convenient breakout board from Seeed Studio that has Ethernet port, Audio DAC and GPIO breakouts. 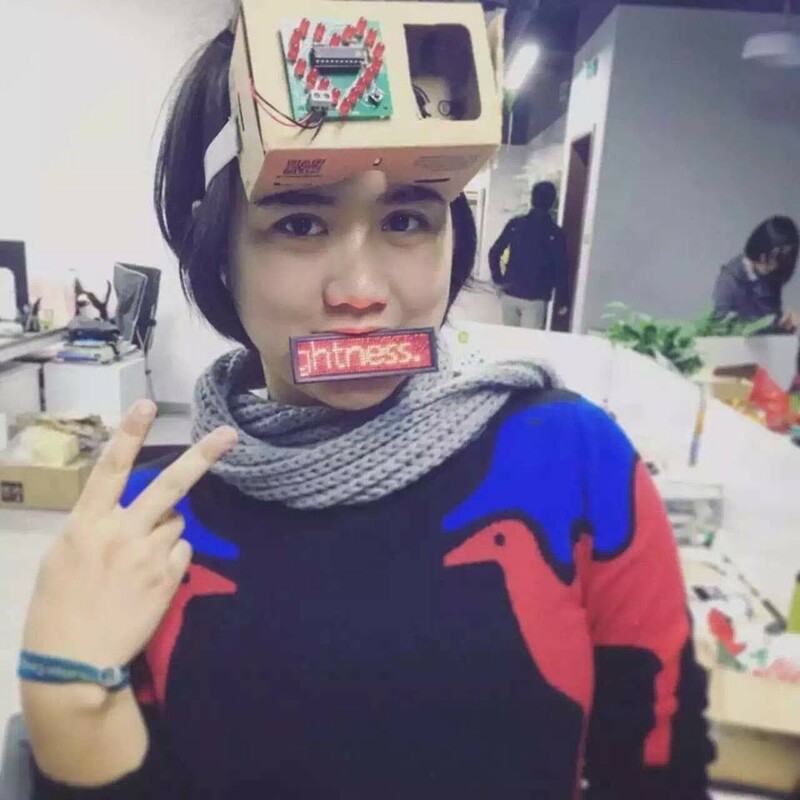 We now go through the construction of the connector, the speaker and finally the frame of the stand itself. The stand is responsible to control and drive the saber blade once it is docked. 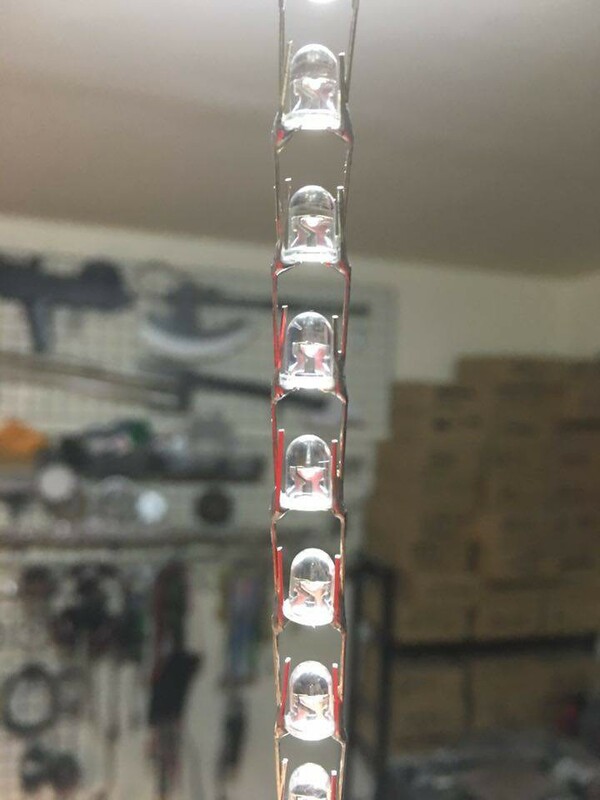 The saber blade part consists of 6 parallel LED chains, each consuming 240mA, so we picked 2N2907 PNP transistor to drive the LEDs, and connects LinkIt Smart 7688 GPIO pins to control the 6 LED chains - and hence the length of the blade. 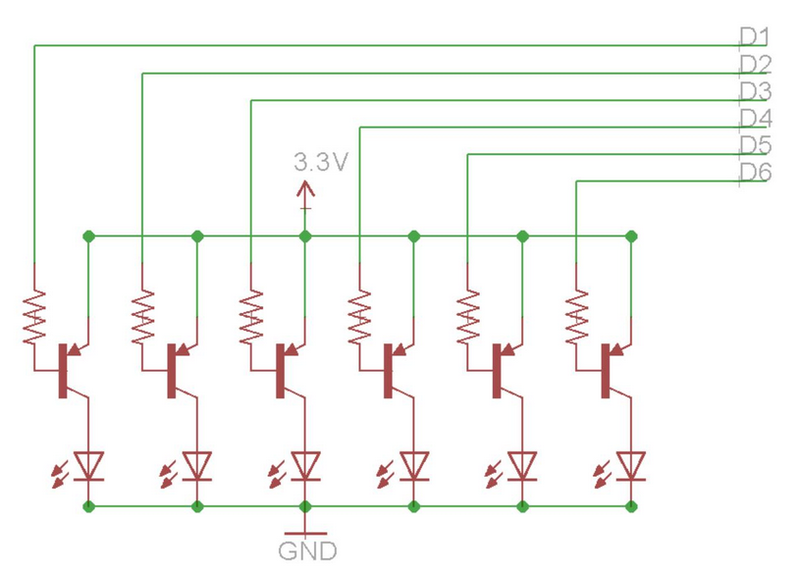 The schematic is shown as below. 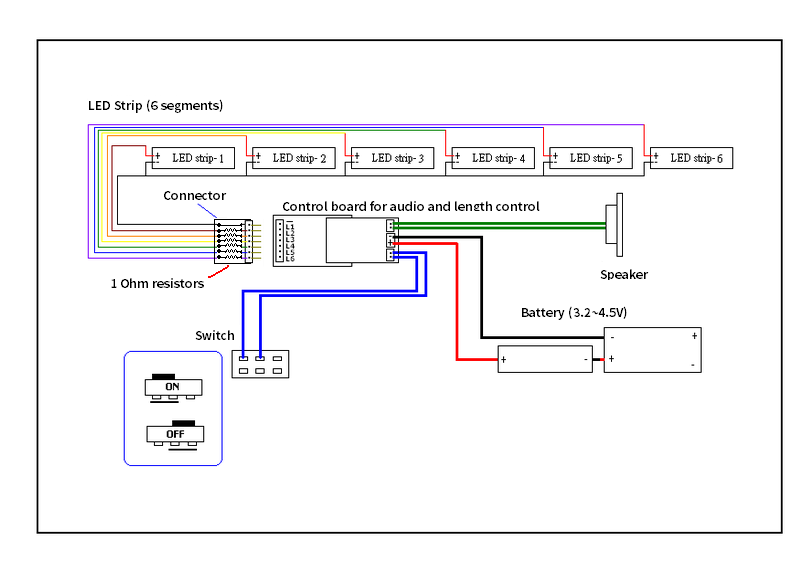 The schematics is quite simple but it's actually quite sophisticated to make the connector - see the building steps tutorials for details. LinkIt Smart 7688 has I2S interface for audio playback - but we need another DAC to convert I2S signals to actual analog speaker signals. The breakout board, as shown below (photo link to Seeed website), already comes with a Wolfson's DAC on it, and an audio jack. We use laser-cut acrylic sheets to construct the frame of the stand. The size of the sheet is 30x30cm. The PDF files used to cut the acrylic sheet can be downloadedhere. Note that during the actual cutting process we need to manually adjust some of the cutting parameters such as output power. The base plate is then snapped to the frame, and tightened with bolt and nut. 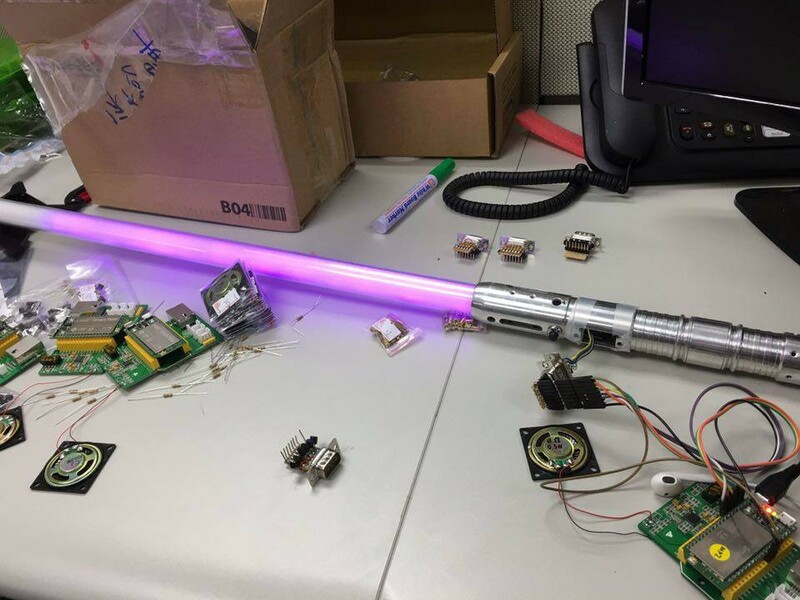 The lightsaber itself requires no software - direct GPIO connection controls and drives the LEDs. We hook a shell script to the scoreboard server, which use `nc` tool to send commands to the server create by the lightsaber stand. The command format is simple - a"6"denotes full-length of the blade, while"1"only turns on the 1st segment of the LED strips inside the blade. 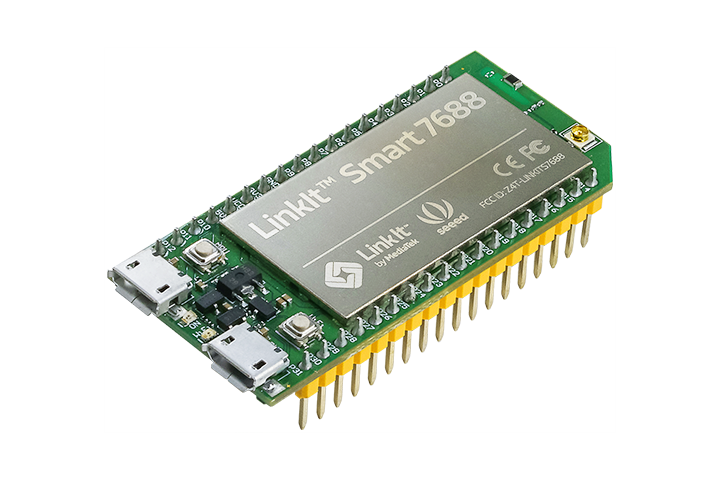 To setup network configuration we use a Python program that runs on LinkIt Smart 7688's Linux. 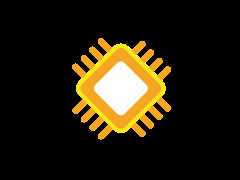 GPIO control is implemented with MRAA library, which comes with default system image of the board. 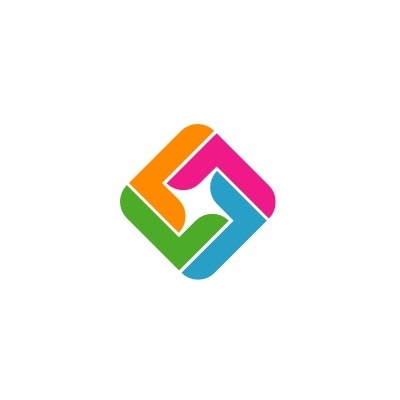 For sound effect playback, we simple uses madplay to play sound effect files.